360 wheel detail and a sling less tire dressing including wheel wells and undercarriage. Hand wash with Ardex Car Soap with carnauba wax and light clay bar** application. 2 times vacuum on the interior including shampoo of seats and carpets***. Leather conditioner on leather seats. A compressed air gun and several detail brushes to remove dust, stains and dirt from hard to reach areas. Hand dried with a microfiber towel, and wax application by hand. Interior wipe down to remove dust and dirt from seats, consoles, dash, doors and radio, all compartments, windows, door jambs, trunk and hood. ** Some vehicles may need extra clay bar. See upgrades section below for price info. *** Some vehicles need additional shampooing and extraction for a deeper cleaning. See Upgrades below for price info. A full car detail is recommended for people who want to keep the value of their car as high as possible. You will be less likely to see things like paint fading, rubber decoloring, bug damage, tree sap damage, bird dropping damage, or leather cracking happening to your car. 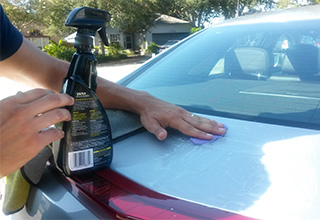 You would want a full car detail over a regular wash if there is dog hair on your car, too many bugs, tree sap, and your windows are not cleaned. You can do a full car detail if you have not waxed it or conditioned the leather for about 5 months when you park on a garage. if you do not park on a garage, ask me about our monthly plan. When another package would be better? A full car detail, is not for someone getting ready to go to a car show. Probably not for someone who is getting ready to sell their car either See Full Spa Detail instead. 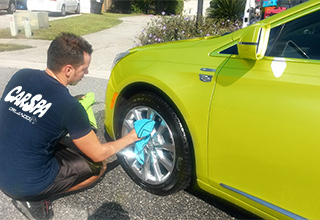 A full car detail is not for someone who has neglected their car for over six months. Not for pet accidents or if someone got sick inside your car and you need to eliminate odors, ask me about the deep cleaning upgrade option. If you would like to maintain your car on a weekly or monthly basis, you can start with a full detail and then do the regular car wash package at least once a month to qualify for a free wax application. Normally, we use Car Candy Soap with Carnauba wax. Also, we use Proper all types wheel cleaner. 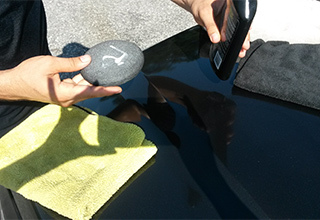 Usually, Meguiar's brand for interior clean. Depending on the car, A variety of waxes could be used, my favorite is Meguiars synthetic wax, cleaners wax and P21S 100% Carnauba Wax upgrade. In most cases, a light clay bar application will do but sometimes a clay upgrade is necessary. Also, we use the best auto window cleaner and Interior protection and leather conditioner. Last, Meguiars' ultra shine water based tire shine or Sling less tireshine . Call, text, or book through this website to schedule the detail service you wish!